nothing says christmas like listening to christmas carolers. for bailey's first outing since her accident, we went to see the desert carolers perform. 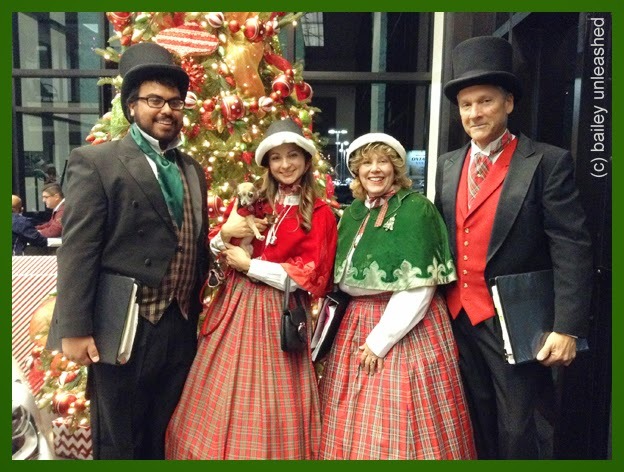 listening to carolers is a sure fire way to get into the christmas spirit. a month ago we didn't know if she would even pull through or if she did, what kind of damage would we be living with and look at her now. she's hobnobbing with carolers! she is our very own little christmas miracle. thanks to ruckus the eskie, love is being owned by a husky & barking by the bayou for hosting thoughtless thursday blog hop. Great to see you out hobnobbing! Yay for Bailey and her first outing! So great seein' you out and about again! this brought tears to my eyes! So incredibly happy for you!! Your daughter is beautiful! Your very own Christmas Miracle! What a great Christmas story. lucky pup to carol with all. . Happy Thoughtless Thursday! Thanks for sharing! Oh dear, I had missed this post. It's so beautiful and so happy to see Bailey out and about especially with dgt. #1, she looks lovely.